I received this beautiful tin of tea for my birthday back in 2015, let’s ignore the fact that it has sat unreviewed for so long! I’ve had it several times since I got it, but I just hadn’t sat down to write about it – until now! I love the tin, it’s bright and has colourful designs all over it. The type face game is strong in terre d’Oc’s game. terre d’Oc is a French company, the internet tells me that they also do cosmetics and fragrances. I greatly appreciate that their packaging comes with French and English. Despite growing up in Canad and taking French (as a second language) in school, my French is incredibly rusty and I would have faltered quite a bit on reading it. On the tin, it states that “In Uzbekistan tea is the hospitality drink served all through the day and first poured three times into a cup and then back into the tea pot. These three repetitive gestures symbolize “loy” : clay, “moy” : fat and “tchai” tea or water.” I love learning about the tea culture in other places, and the packaging also suggests to drink the tea straight without milk or sugar. The lid of this lovely decorative tin fits snugly for a good seal. The dry leaf of this tea has a sweet smell to it. I can make out the almonds, and what smells like apricots and plums (stone fruit). The black tea base smells malty, like an Assam would. The ingredients for terre d’Oc’s Uzbekistan Style Black Tea with Almond and Pistachio is as follows: black tea (organic), natural flavour almond, pistachio and apricot, almond pieces, pistachio pieces, and marigold petals. The packaging’s steeping instructions are to steep in 95°C (203°F) water for 5 minutes. It also says that this tea is “ideal any time of the day”. Ever the rebel, I steeped my first pot of this tea for four minutes to see how the flavours were and to see if it needed a little bit longer. 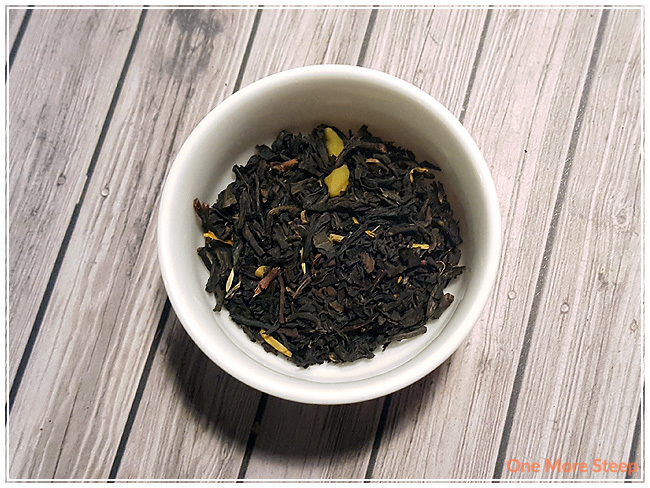 Uzbekistan Style Black Tea with Almond and Pistachio steeps to a deep, deep orange. There’s a malty smell to it that continues to remind me of an Assam base, with a subtle almond smell but I can’t smell the apricots or pistachio. On first sip, after it cooled down a bit, there’s the malty flavour from the black tea base and the light sweet fruity flavours of the apricot. 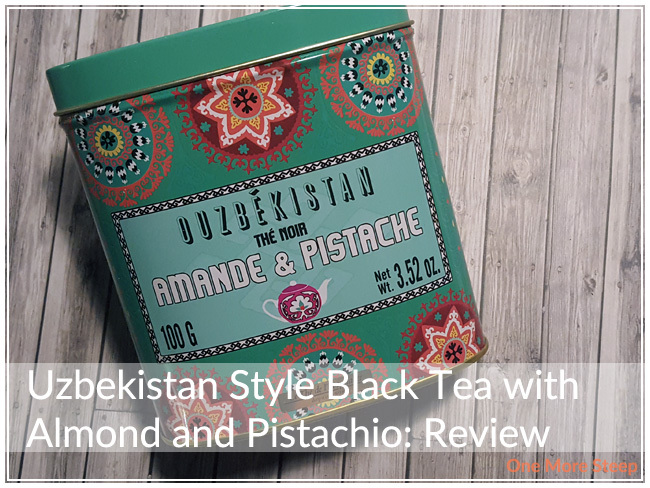 I can taste the almonds, although it isn’t very strong, and no pistachios were noted in the overall flavour profile of Uzbekistan Style Black Tea with Almond and Pistachio. There’s a slightly astringency noted at the tail end of each sip that leads to a bit of mouth puckering. Despite the packaging suggesting to not drink this tea with sugar or milk, I did want to try. I found adding sugar helped to bring out the fruity flavours even more and bring that apricot flavour to the forefront. I also found that added evaporated milk helped to temper the astringency. I resteeped Uzbekistan Style Black Tea with Almond and Pistachio twice. 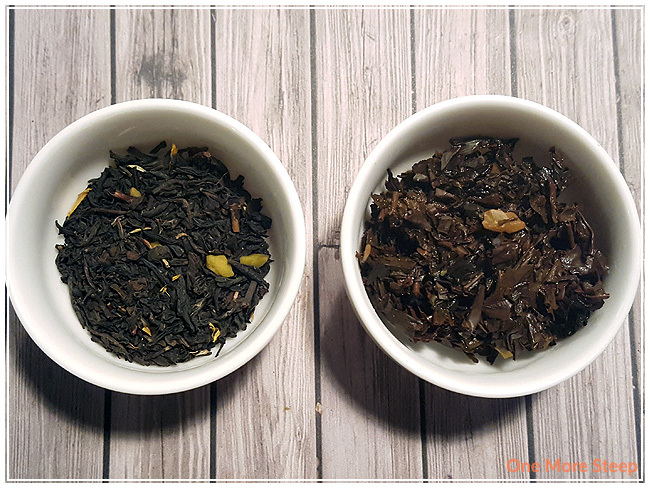 The second steep was very similar to the first steep in terms of flavours and astringency, the third steep was a bit watery and not as good. I would say that this black tea is good for one more steep only. I liked terre d’Oc’s Uzbekistan Style Black Tea with Almond and Pistachio. 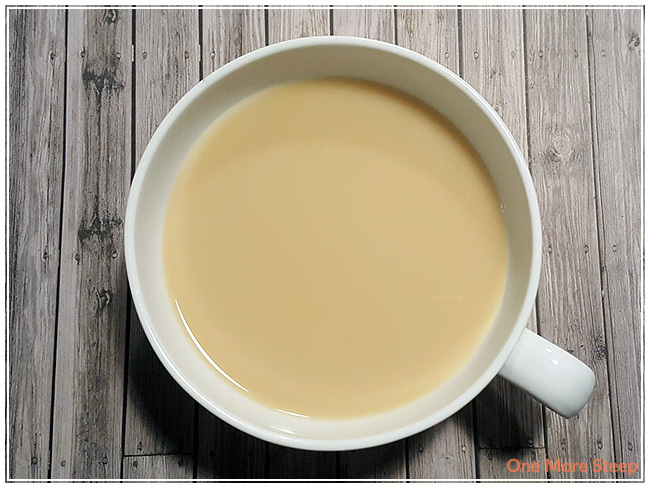 The overall flavour is very good, and I found I liked it better doctored up with a bit of sugar and evaporated milk (but the flavour without the additions is still good and tasty). The beautiful tin helped me to learn a bit about the Uzbekistan tea culture, which I found very educational. I was disappointed in the fact that I wasn’t able to smell or taste the pistachio in the dry or steeped tea, and that’s part of the reason why I didn’t rate it higher. 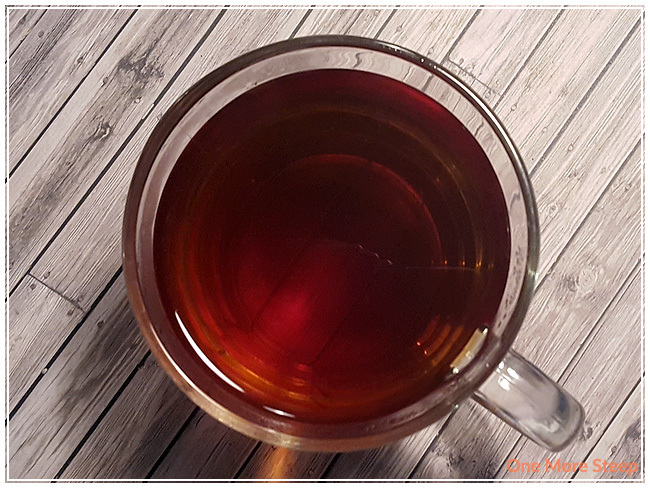 I think it’s a delicious tea, the natural sweetness and fruity flavours in it would lend itself well as a tea to go with desserts or a session of afternoon tea.